Whether you've always dreamed of running a marathon, long to start your own business or aspire to see your name in lights, we all have ambitions and goals in life. However, often we don't feel good enough, lucky enough or talented enough to get what we want, so too often our dreams go unrealised. To make sure your aspirations don't remain a distant dream, check out these 10 steps for achieving your goals. Most of us have hundreds of things on our wishlist of things we want to do, from losing our muffin top to buying our dream home. However, if you want to effectively tackle an important goal, it is important not to overload yourself and to go after one ambition at a time, starting with the goal most important to your overall happiness. Also, while it is good to aim high, it is also important to choose a goal that is attainable and which fits with your talents, lifestyle and who you are as a person √¢‚Ç¨‚Äú don't go after a goal just because it is something you feel you should do. We often make broad declarations about what we want out of life, such as "I wish I was fitter", "I'd love to have more money" or "I want to make a difference to the world". However, these vague, intangible goals are hardly ever accomplished as, in order to achieve your goals, you need to be specific about what exactly it is you want; how do you want to make more money? What could you do to make a difference? 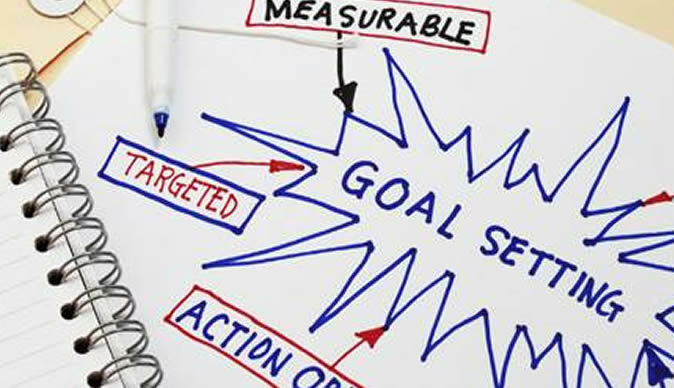 Set specific and measurable goals such as "I want to start exercising three times a week" or "I want to become the manager of my company" so that you have something to aim for and can measure your progress. In order to get where you want in life, you need to understand exactly how you can get there, and the best way to do this is to ask those who know. Whatever your ambition, there is bound to be someone out there who has already achieved it, and their advice and experience could prove invaluable. Browse the internet, take a course, read books on the subject and get in contact with people who have achieved your goal. By getting a clear of understanding of how others have achieved the same ambition, you will be well equipped to follow in their footsteps. When you first look at your goal it may seem slightly overwhelming. How on earth are you ever going to score your dream job/run a marathon/write that novel? However, by breaking your overall ambition down into 'mini goals' (such as completing a 5K race or writing 200 words a day) you will not only make your goal seem more achievable but you will give yourself specific things to aim for along the way. Write down your plan of action √¢‚Ç¨‚Äú what you want to achieve and how you can get there, step by step. Then tick off each 'mini goal' as you achieve it to give yourself a visual representation of your progress. Often the reason we don't achieve our goals is because we keep putting them off until a "better time" in the future. However, this better time may never come, and in actual fact the best time to start chasing your dreams is right now. Ask yourself what you can do this week to make your dream happen. What can you do right now? Also, evaluate what it is that is stopping you from going after your goal (such as lack of time or financial restraints) and see how you can work around these things. Don't leave your goal as a distant dream; take action and start pursuing it right now. It may sound cheesy, but to achieve your goals in life you have to get in the right frame of mind, and that means believing you can do it. Confidence in yourself and your abilities can get your far, and setting out with a positive mind set is important. However, while many of us start out brimming with confidence, setbacks and perceived failures can soon diminish this, so it is important to take measures to stay motivated. Reward yourself and take pride in every little achievement, and remember that everyone who has achieved anything difficult has had little setbacks from time to time, so don't let this take away from your successes. To help boost your motivation and stay on track towards your goal, it can help to share your ambitions and tell people about your goal. The more people you tell the more committed to the goal you will be, and the more people you will have to help you. Not only can friends and family offer you support when you need it, but they may be able to keep their eyes and ears open for opportunities and people who can help you to achieve your goal. Also, if you know someone else who is striving for the same goal, sharing your experiences and offering each other support is an even better way to boost your motivation. It can be easy to get so caught up in day-to-day life that there's no time to strive for anything out of the ordinary. However, if you want something enough, it is important to make time for it. We often spend far too much time on things that aren't that important to us or that don't really need doing, but by cutting back on these times you will give yourself more time to go after your goal. Write down all the things currently clogging up your schedule and then identify those things you can cut back on. You can also maximize your time by getting up earlier or using your lunch hours more effectively. Sometimes, no matter how much background research you do, how many hours you put in and how meticulously you plot your route to success, things just don't quite go to plan. However, the key to achieving your goals is to be flexible and ready to come up with a plan B (or C or D) when this happens. Rather than focusing fixatedly on minor setbacks in your plan, try to formulate several backup plans to help you bounce back from any setback and stay on track towards your ultimate goal. While rewarding your progress and striving towards mini goals is a great way to stay motivated towards your overall dream, if you still find yourself feeling disillusioned from time to time it is important to remind yourself why you want to achieve this goal. Picture yourself having achieved this goal already and consider what it means to you. What will you gain from achieving this goal? How will it make you feel? If you do find along the way that you have forgotten why you want your goal at all, then perhaps this is a good time to reassess your goals and strive for a new ambition.